Selling Your Book Online: The Espresso Network - the 7th Book Distributor. The Espresso Network - the 7th Book Distributor. Found a new place for Indie Authors to Publish their books - the Espresso Network. This was an interesting find - and wound up with another way for you to self-publish books. Yes, of course it's free. The catch - only print, and only 25% royalty/commission. But the upside - you can get sales you'd have missed otherwise. Espresso has a nice network of machines internationally. They have a database for all these machines with somewhere more than 6 million books in it. These machines are at colleges and bigger bookstores where there's enough traffic to support the cost. Meaning, you have a way to get books sold and more people looking for your book in new places. The trick is to get into that database. Now it's not an easy find. 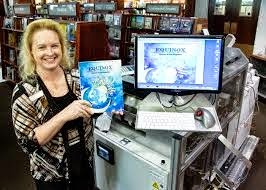 They've set up a self-publishing scene which will run you $59 per book setup to have your own copy of that masterpiece you've been slaving over - and anyone can order your book via EBM Network after that. Or, you can publish to Lightning Source for $75 per setup - which gets you entered into the Espresso database as well as into their Global Reach. Or, you can figure out how to do it for free. Here's the shortcuts you've been waiting for. Getting published via Espresso EBM network. The root page is OnDemandBooks.com - but that's not how you get your book published for free. You have to wade through all these pages where they want you to pay to set up your book, as I've covered. The trick is to recognize that you're your own publisher. There's a link which says Publishers with less than 100 titles U.S. only. (And another link for everywhere else.) If you go there, you'll have a nice little application to fill out. And they'll ask you to send them a file which passes their standards. Here's the trick: submit interior and cover PDFs from one of the books you published on Lulu. That's all it took for me. That should get your application approved, and then you'll get a login - from there, you upload as many books as you have ready. Means you can simply re-publish your books which you've already published as a hardcopy on Lulu. That then makes yet another free distributor you can use to get your book out to the world. Lulu (ships everywhere else, including Amazon), Espresso Book Machine Network (recommended after you've already published with Lulu). 4) When you approve your proof, Lulu distributes your print version pretty much everywhere. Take those PDF files and submit to Espresso Network. 5a) Bundle your Ganxy books for additional direct sales. 6) Research Scribd and Doc-Stoc to see if you can port your PDF ebook there. Breaking through into a new world of ebook marketing - you can, too! Screw Leanpub - original works only.